Panasonic’s flagship high-end compact the Lumix DMC-FZ200 is aimed at serious enthusiasts looking for an all-in-one shooting solution for holidays, day trips and general photography. It features a 24x optical zoom with an equivalent 25-600mm focal range and a fixed f/2.8 maximum aperture. The latter is unusual for a bridge camera and should be of interest if you’re considering one for sports or wildlife photography. Its impressive features don’t stop there either and although continuing to use the 12.1 megapixel High Sensitivity MOS 1/2.3-type sensor found on its predecessor, the Lumix DMC-FZ200 offers a number of other improvements. These include a higher resolution 1.3m Dot EVF, a greater 100–6400 ISO range, an improved 60secs – 1/4000sec shutter speed range, not to mention High Speed movies, a HDR mode and improved battery-life. The Lumix DMC-FZ200 also features 1080 60p video in AVCHD or MP4 formats, a 3.0-inch, free-angle 460k-dot LCD screen, Panorama Shot mode and RAW+JPEG image capture. So does all this extra functionality affect the good DxOMark Scores achieved by its predecessor? And with a $598 price tag how does it rank against cheaper rivals like the $450 Canon PowerShot SX50HS with its incredible 50x zoom or the $450 Nikon COOLPIX P7700? We put all four cameras in one review to see how their DxOMark Sensor Scores compare. Achieving a very similar DxoMark Sensor Score to its predecessor the latest LUMIX DMC-FZ200 maintains the image quality of the LUMIX DMC-FZ line of Bridge cameras. With a DxOMark Overall Sensor Score of 37 the LUMIX DMC-FZ200 ranks 181st for all Camera Sensors on our database and 16th Overall for High-end Compacts. Pitted against its predecessor the new LUMIX DMC-FZ200 scores marginally worse in all 3 categories and as a result finishes with an Overall Score that’s 3 points lower than the 40 achieved by the LUMIX DMC-FZ150. This isn’t significant however, as a difference of 5 points only equates to +1/3 of a Stop improvement, so in real terms the FZ150 & FZ200 have the same image quality. The FZ200 maintains the image quality of the LUMIX DMC-FZ line, but image quality on the smaller 1/2.3-type sensor Panasonic use in their Bridge cameras does take a back seat compared to their Mirrorless Hybrid offerings featuring the larger Micro Four Thirds sensor. 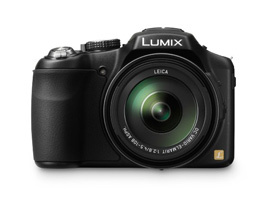 Take for example the lowest ranking Panasonic Hybrid the Lumix DMC-GF3, which, with an Overall Score of 50, scores 13 points higher than the Lumix DMC-FZ200. This difference equates to over +2/3 of a Stop better image quality for the Micro Four Thirds option. The Lumix DMC-FZ200’s Overall score of 37 places it 16th out of the 18 Panasonic high-end compacts, Bridge and Micro Four Thirds cameras on the DxOMark database. Canon PowerShot SX50 HS Vs Panasonic LUMIX DMC-FZ200: Does the same size sensor mean the same image quality? As another bridge camera the Canon PowerShot SX50 HS shares some characteristics with the Lumix DMC-FZ200, but there are key differences, too. For example the FZ200 offers a higher resolution EVF, slighter larger LCD screen and boasts Full HD video at 1080 60p. The SX50 HS on the other hand offers an incredible 50x optical zoom with an equivalent focal range of 25-1200mm, which is twice as much zoom as the Panasonic. Whereas the maximum aperture on the FZ200 is fixed through the zoom range however, the Canon uses a variable aperture. This means when fully zoomed-in the SX50 HS’s maximum aperture closes down to f/6.5, letting in less light than the f/2.8 aperture on the FZ200. With an Overall Score 10 points higher than the LUMIX DMC-FZ200, Canon’s rival Bridge camera, the PowerShot SX50 HS, offers +2/3 stop improvement in image quality. Both cameras also use a very similar size 1/2.3-type sensor with a 12.1 megapixel resolution, so it wouldn’t be unreasonable to assume they have similar image quality. With an Overall DxOMark Sensor Score of 47 for the Canon SX50 HS, compared to 37 for the FZ200 however, the Canon SX50 HS offers an improvement of +2/3 of a Stop image quality over the Lumix DMC-FZ200. Drill down a little further and with a Landscape (Dynamic Range) Score of 11.2 Evs vs. 10.8 Evs the SX50 HS is +1 Stop better than the FZ200 for Dynamic Range. The Canon also has the edge in the Portrait (Colour Depth) Score, boasting a +2/3 Stop improved performance scoring 20.3 bits compared to 19.1 bits for the Panasonic FZ200. Despite the same size sensor and resolution the Sports (Low-Light ISO) Score of 179 ISO on SX50 HS compared to 114 ISO on the FZ200 means the Canon is also +2/3 of a Stop better in low light. So with the Canon you can pump up the ISO a bit higher, but bearing in mind the fixed maximum aperture offered on the Panasonic if you’re shooting with the FZ200 you might not have to. Canon’s SX50 HS offers an improved ISO performance of +2/3 of a Stop but the Panasonic’s fixed f/2.8 maximum aperture makes it possible to use lower ISO sensitivities on the FZ200. The Nikon P7700 offers a more compact build compared to the bridge styling of the FZ200, doesn’t feature a viewfinder and has a shorter focal range of 28-200mm. The P7700 also has a variable f/2 – f/4 maximum aperture, continuous shooting is slower than the FZ200 at just 8fps and the highest resolution HD video capture is limited to 1080p at 30fps. The larger 1/1.7-type sensor in the Nikon P7700 high-end compact results in a +1 Stop improvement in image quality Overall compared to the Lumix DMC-FZ200. Its big advantage however is sensor size, with the P7700 offering a 12.2-megapixel resolution but on a larger 1/1.7-type sensor. The difference this makes to image quality is apparent in the Sensor Scores with the P7700 achieving an Overall DxOMark Sensor Score of 53, compared to 37 on the FZ200. That gap of 16 points means the Nikon offers over +1 Stop improved image quality over the FZ200. This is consistent across the various categories too, with the P7700 boasting +1 Stop improvement in Landscape (Dynamic Range), 11.7 Evs to 10.8 Evs, and +2/3 Stop better for Portrait (Color Depth) with 21.1 bits to 19.1 bits. That said the improvement for ISO performance on the P7700 isn’t as stark as it might be bearing in mind that larger sensor. With a Sports (Low-Light ISO) score of 191 ISO on the P7700, compared to 114 ISO on the FZ200, the Nikon offers just a +2/3 of a Stop improvement. The P7700 offers +1 Stop extra Dynamic Range for acceptable results compared to the FZ200 where Dynamic Range suffers badly shooting above 800 ISO. With a +2/3 of a Stop improvement in the Portrait Score, Color senstivity is maintained up to 1600 ISO on the Nikon P7700 compared to only ISO 800 on the Lumix DMC-FZ200. With an Overall DxOMark Sensor Score of 37 for the Lumix DMC-FZ200, compared to 40 for its predecessor the FZ150, this latest Panasonic Bridge camera maintains the good image quality of the DMC-FZ line. Despite the slightly lower score than its predecessor a difference of only 3 points equates to less than -1/3 of a Stop overall and in real world terms there’s no difference. The FZ200 also boasts some impressive specifications, the most notable of which is the fixed f/2.8 maximum aperture. If you’re after a compact style camera for sports and wildlife photography this is significant as it enables you to use lower ISO settings for better quality images when fully zoomed in. The drawback however is the FZ200’s image quality is really surpassed by both the Canon SX50 HS and Nikon P7700. In the case of the SX50 HS its DxOMark Sensor Score of 47 ranks a full 10 points and +2/3 of a Stop better than the FZ200, which is a little surprising considering both cameras feature the same sized sensor and 12-megapixel resolution. Utilizing a larger 1/1.7-type sensor however it’s no shock that the Nikon P7700 offers the best image quality of the 3 cameras. With a DxOMark Sensor Score of 53 it’s a full 16 points ahead and offers +1 Stop improved image quality over the FZ200. So the Panasonic Lumix DMC-FZ200 bridge camera boasts a top specification but if image quality is more important the Canon SX50 HS or Nikon P7700 both rank higher in the DxOMark Sensor Scores and cost less on the high street, too.